USA Patriotism! proudly recognizes . . . patriot Rich Little for his support of our troops through the USO. Originally from Canada, Master Mimic Rich Little first performed for the troops in the 1960's at the Marines' Camp Pendleton. He also joined Bob Hope and other stars in a USO tour to Korea in the 1980's. 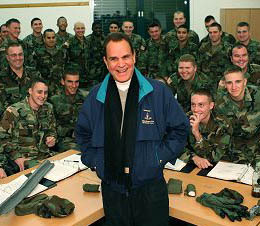 More recently, Rich Little took his comedy show overseas in December 2004 and December 2005 as USO tours to entertain the troops in Italy, Turkey, Germany, and the Netherlands . . . and providing as much one-on-one interaction with them as possible. The troops were treated to many of his 200 impressions that range from Louis Armstrong and Frank Sinatra to Donald Duck and Kermit the Frog. Other impersonations include Arnold Schwarzenegger, Sylvester Stallone, Jack Nicholson and Clint Eastwood. This versatile entertainer began his career at age 12 when he mimicked the voices of his teachers in answering their questions. He got his start in nightclubs and moved on to television, where he appeared in more than 50 television programs, ranging from variety shows, series and specials. Named "Comedy Star of the Year" by the American Guild of Variety Artists, he has nine comedy albums and three HBO comedy specials to his credit. 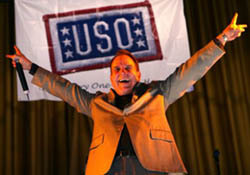 a performance for the troops on a USO tour in 2005.